Clayworks Clay Plasters inject health and wellbeing into design, architecture and construction. Levels of pollutants can be 5 times higher indoors than outdoors. As Europeans spend 90% of their time indoors the exposure to toxins, VOCs, moisture, mould, toxic chemicals, biocides and pesticides is alarming. A study led by Harvard University in 2015 concluded that participants in a greener building environment have 61% higher cognitive scores than those in less green buildings. The study involved controlling the presence of VOCs (many of which are harmful to human health) and carbon dioxide and doing a series of strategic and response tests. Ventilation is often touted as the answer, but we believe that the more we can get the fabric of the building to do, the less we rely on technology – a ‘fabric first’ approach. Or a ‘passive house’ approach. The trend for honest, natural, chemical free and naturally beautiful materials, that can be sourced sustainably, is currently powerful, with wood, earth and straw all making strong comebacks. Clay plasters still evoke thoughts of mud huts, but that’s not the case anymore. 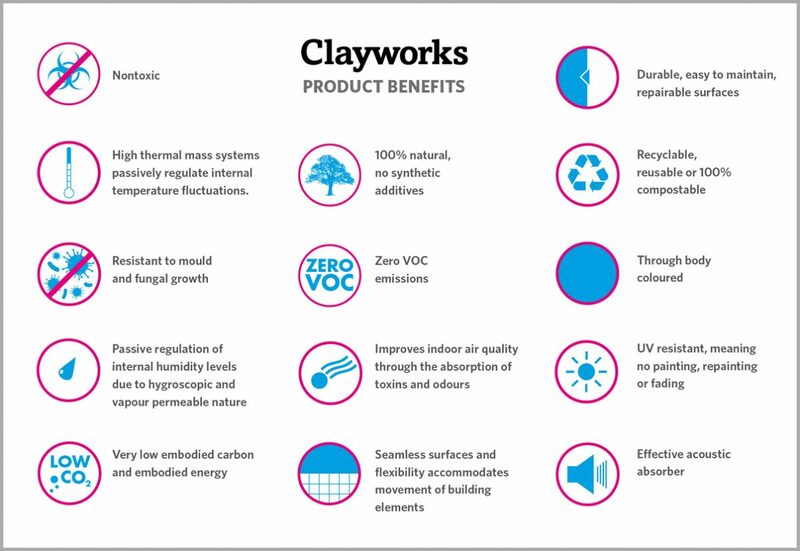 With ingenuity, science and innovation, years of hands on research and experimentation, the assistance of a world class materials testing centre and innovate UK funding, Clayworks ready-made clay plasters are products that are truly problem solving. Surely one of the building materials of the future?